The Labeda Eyes Skateboard is a complete skateboard deck from American company Labeda, who not only produce Labeda skateboards, but also design products for a wide variety of wheeled extreme sports, such as roller hockey and inline skating. 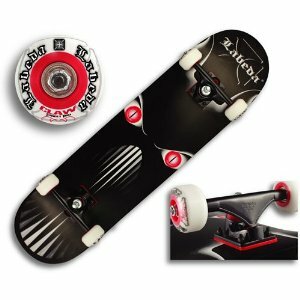 In fact, according to the Labeda skateboards website, it appears that the main focus of their business is both inline roller hockey and skateboarding, but other than a link that says skateboarding which takes you to a photo gallery of their hockey players, there is no other mention of their skate products on their site. This means it will be very interesting to see how the Labeda Eyes Skateboard stacks up. 7-Ply laminated Canadian Hard Rock Maple with 1 ply red stain. Double kick tail and grip tape. The Labeda Eyes Skateboard is a complete skateboard deck, and every aspect of this board is made by Labeda Skateboards. It is interesting to see a company who primarily focuses on indoor roller hockey branching out into skateboarding, even though it isn’t that much of a stretch for them to do so. The deck itself has a nice weight to it – it’s more substantial than what you would expect from a deck that sells at such a low price for a complete skateboard. For the novice skater, it is good; sturdy yet affordable. For experienced skateboarders and boarders who really like to power through their tricks, or ollie down a huge flight of stairs, it’s not so great as the board would likely break after a few times of usage. But for those starting out and working on ollies and nose, tail and board slides, there won’t be any problems. The one thing that you do notice about this board is that the bearings could certainly do with an upgrade. This is probably the biggest criticism about the Labeda Eyes Skateboard. However when looking at it with a focus on novice skateboarders, they can certainly benefit from the slower wheels. Like any cheap deck that you can purchase at a sporting goods store, it will take some tinkering with to work the bugs out and fix what changes Labeda Skateboards have made to appeal to a mass market audience before the board can truly be useable. However, it is not the kind of deck you would want to invest a lot of money in upgrading the bearings and wheels, which are also on the softer side. The Labeda Eyes Skateboard is not by any stretch of the imagination meant for the experienced skateboarder. Just like any skateboard that you would purchase at a sporting goods store or at Walmart, the Labeda Eyes Skateboard is meant to be an introductory skateboard for new skateboarders and youngsters who are just starting out. And in that respect, Labeda Skateboards knock it out of the park providing great value and quality at a low price. The Labeda Eyes Skateboard is currently $59.99 on Amazon with 10% off the RRP. This entry was posted in Labeda, Reviews, Skateboarding, Skateboards and tagged Labeda Eyes, Skateboard. Bookmark the permalink.